A panoramic view of the GMRT telescope, located near Pune, India. After the NenuFAR telescope last year, LOFAR, the VLA, and others before, the SKA Organisation has now officially granted SKA pathfinder status to the emblematic Giant Metrewave Radio Telescope (GMRT) located near Pune, India. 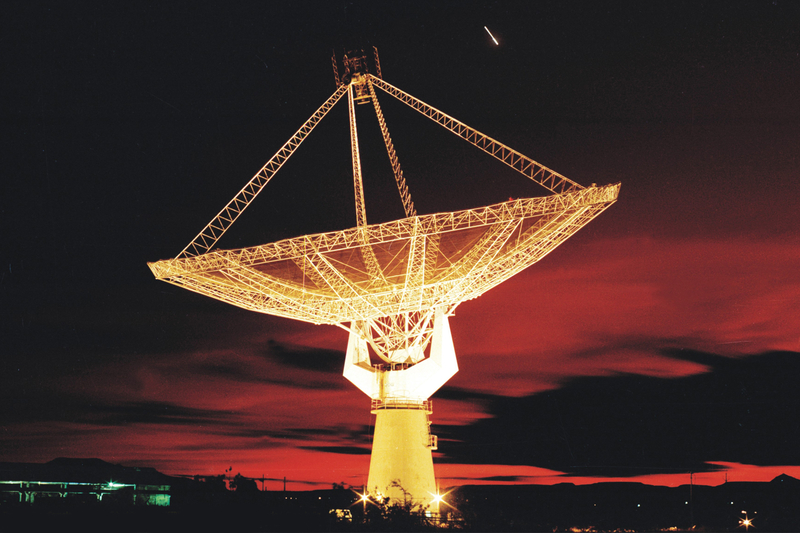 SKA pathfinders are telescopes and systems dotted around the globe (as opposed to precursors which are located on the SKA sites) that are engaged in SKA related technology and science studies, bringing valuable feedback to the teams designing the SKA. GMRT is today a major international facility for work in low frequency radio astronomy. It consists of 30 fully steerable antennas of 45 metre diameter each that provide a total collecting area of 30,000 m2, covering a frequency range of 150 MHz to 1.5 GHz. It is operated by the National Centre for Radio Astrophysics (NCRA) in Pune, a member of the SKA Organisation. NCRA is a division of the Tata Institute of Fundamental Research. The telescope has been in operation in the international arena for over a decade now, and is used by astronomers from all over the world, with about 50% of users coming from outside India. This state-of-the-art instrument has explored many interesting and new areas of astrophysics, and many of the scientific investigations carried out at GMRT have important relationship with the SKA science goals e.g. Epoch of Reionisation and pulsar astrophysics. As such, they are instrumental in building up and training a vigorous community of SKA users in India and abroad. “Being accorded SKA pathfinder status is an important recognition for the GMRT, and will provide a significant fillip to Indian interest and participation in SKA related activities – we look forward to contributing both technologically and scientifically to this grand project.” said Prof. Yashwant Gupta, Dean of the GMRT Observatory & Senior Professor at NCRA. NCRA joined the SKA Organisation as a full member in August last year and later this month will be hosting the annual meeting of the Astronomical Society of India in Pune, where hundreds of astronomers will gather and a day of talks will be dedicated to the SKA. Testimony to their importance, GMRT and NCRA were recently featured in an award-winning article (highly commended in the 2014 European Astronomy Journalism Prize) on India’s vibrant astronomy community. GMRT is currently undergoing a major upgrade that will improve its sensitivity by a factor of up to three. Many of the upgrade activities have significant synergy with the SKA and can play a role in the development of technologies relevant to what will be the world’s largest radio telescope. In particular, the next generation monitor and control system for the upgraded GMRT is being developed as a prototype for the SKA Telescope Manager (TM), with the Indian leadership of the SKA TM work package providing a direct point of synergy. A full list of precursor and pathfinder facilities is available here.